Have you ever eaten a flower before? (No, I’m not talking about the couple of dandelions that you may have swallowed as a child) Well we just had some for lunch! Here in Costa Rica, a white flower that grows on the Itabo tree (shown in the large photo) is now in bloom, and, on many street corners and country roads, one can see vendors selling bunches of these. Known as “The Flower of the Dead” in Nicaragua, this flower is a regular meal here in Costa Rica. Our friend Mayra had us get some from the property of CINCEL in order to make what is shown in the inset picture. 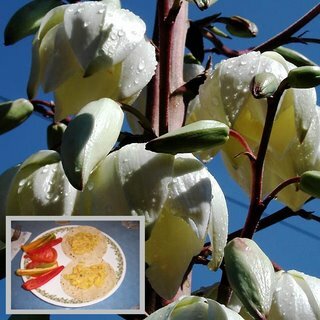 The green, bitter part is removed, and then the flower is boiled with potatoes before frying with eggs, onions, some pepper, and salt to taste. The resulting mixture is then placed over tortillas in order to make a delicious “gallo”, or snack served over a corn tortilla. Reactions were mixed here in the household. I enjoyed the meal, eating four of the gallos de itabo. Kelly and Rebekah as well commented that the food was delicious. Jonathan ate all of his, without asking for seconds and Joseph had to be told to finish. All in all, I would rate it a success but designed for more mature taste buds. Hi Guys!! Hey, I wondered what those flowers would taste like. Glad Mayra gave you the opportunity to taste them! That is pretty good- 4out of 5. Just think if you were in the jungles of Africa what lovely things you could be eating.. I will try to save you some lovely ants that are entering my kitchen so we can have chocolate covered ants when you come! Hugs to everyone.